Nearly every beading tutorial book has at least one project for a non-wearable beaded object or accessory, and one of the most common is tassels and fobs that can be used as fan pulls and zipper pulls. Although they can be gorgeous, and a fun way to showcase beads, I’ve never felt the desire to make one myself just for fun. Then necessity became my inspiration. On a recent thrifting trip, I picked up a really cute leather purse that was in great shape. But, after only a few weeks, I managed to wear out the zipper pull, leaving only a little ring to grasp while opening and closing the pouch. Spirals Micro Macrame Keychain Tutorial by KnotGypsy - This one is so pretty, and would be a great project for leftover beads. Frog Prince 3D Keychain by Cassandra Elizabeth - So cute! A great idea for using kits and 3D beading patterns. Two-Dimensional Star Dangle by Lynn of 3DBeading.com - Simple and beautiful. This one might not stand up to lots of wear, so it might be nice paired with a length of chain. 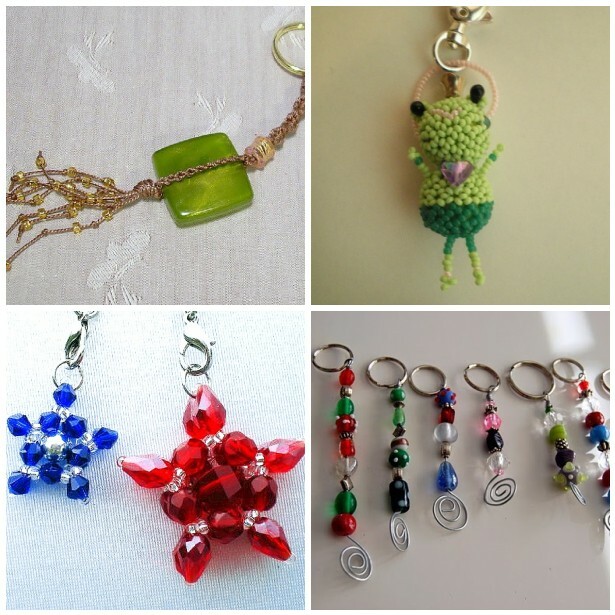 Beaded Wire Wrap Keychain Tutorial from Tatertots and Jello - Classic and simple, another great leftover bead option. I also thought it might be fun to adapt those funky animal shapes woven with plastic pony beads, and use 6/o seed beads instead. And sure enough, I found a seed beads animals project that uses the classic technique. Although I found a lot of projects that I liked, none of them quite fit my style. Instead, I turned to my collection of Un-Finished Objects for a solution. I found a pair of RAW beaded rings that I had made for a chain link bracelet and never used. I added an old key ring and some peyote strips and made my own custom zipper pull. I like the look of the bag a lot more than before! I think it’s excellent proof that beads can do so much more than make great jewelry. Perhaps I’ll have to look for more ways to dress up my universe with beads.